Our full evening theater extravaganza! 90 minutes of belly laughs and wow moments. 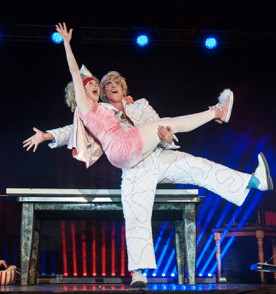 Performed by two charming yet comically inept characters, everything we do has been woven into an funny story about a way-too-enthusiastic assistant and her wonderfully clumsy magician. Requires a stage of 12 by 8 meters. Grand Dellusions requires a stage of at least 8 x 6 meters, theatrical lighting and a sound system. 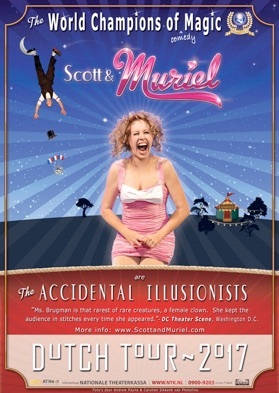 Our solution for a brilliant comedy and illusion show right on the dance floor! Or where ever you might have 3 x 3 meters of flat ground! Our answer to all your party entertainment needs! 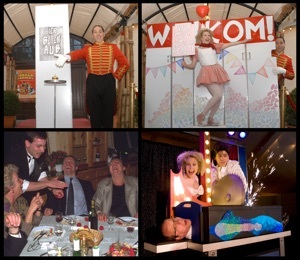 An evening full of fun and surprises starting with our Entree Act at the door, followed by Close Up Magic between the guests, and then, as a climax to you event, our Grand Dellusions or Two by Two Show. Hours of entertainment for a very reasonable price... How can you go wrong?